Bloody clashes between protesters and anti-riot police raged overnight in Cairo’s Tahrir Square, as new scuffles erupted on Wednesday amid mounting frustration with Egypt’s military rulers over the pace of reform. Hundreds of angry protesters gathered in front of the interior ministry headquarters in central Cairo, burning tyres and pelted police with stones, a security official said. He said the army had been called in to restore calm. Witnesses said the overnight disturbances, which left up to 80 people injured, were some of the most violent in months in the square, which was the focal point of protests that forced veteran president Hosni Mubarak from power in February. They accused loyalists of the ousted leader of stirring up the violence after municipal councils they dominated across the country were dissolved by court order on Tuesday. Around 4,000 people were in Tahrir Square during the night and the clashes left between 70 and 80 people injured, the official said. The health ministry said that up to 590 people were injured, including from smoke inhalation, and that of those 75 had been hospitalised. Activists called for an open-ended sit-in in the square. The ruling military council warned of a plot to destabilise the country. But the army called on protesters not to give in to “schemes” aimed at sowing chaos. “The regrettable incidents in Tahrir Square… are designed to destabilise the country and pit the revolutionaries against the police,” the Supreme Council of the Armed Forces said in a statement. The clashes “have no reason behind them except to destabilise Egypt’s security and stability in accordance with a carefully thought out and organised scheme,” the council said. The interior ministry said a football match between bitter Cairo rivals Ahly and Zamalek would be played as scheduled on Wednesday evening, after the Egyptian football association had said it was cancelled. Riot police trucks were heading towards Cairo stadium to prevent any clashes there, the official said. A white cloud of smoke hung over the square before dawn as security forces repeatedly fired tear gas to try to disperse the protesters who numbered in their thousands, an AFP photographer reported. The interior ministry blamed families of victims killed in the uprising saying some of them stormed a theatre where a memorial service was being held for those who died. A security official said that clashes erupted and the families were then joined by hundreds of protesters who began to throw rocks before heading to Tahrir Square. But activists said police beat the families who had been barred from joining the service. “After being denied entry…. clashes erupted between protesters and security guards at the theatre. The police showed up and started beating the families of martyrs,” pro-democracy activist Arabawy wrote on his blog. Nearly 850 people were killed during the popular revolt that brought an end to Mubarak’s 30-year rule. Witnesses told AFP that buses unloaded young men armed with sticks and knives, and accused loyalists of the old regime of stirring up the trouble. 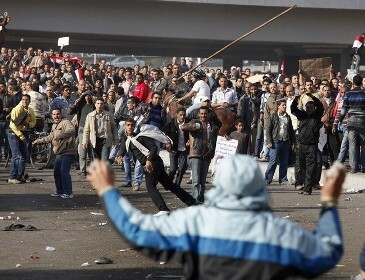 After protests erupted against Mubarak’s rule on January 25, the authorities deploying hired thugs in a bid to quell the unrest. Tuesday’s clashes broke out just hours after a Cairo court ordered the dissolution of municipal councils across the country, all of which were dominated by members of Mubarak’s now disbanded National Democratic Party. “I don’t think the timing of these clashes is a coincidence,” one witness told satellite channel ON TV. “It came just after the dissolution of the local councils, a decision which I’m sure will make many people (from the old regime) very angry,” the witness in Tahrir Square said. Television footage showed protesters chanting: “the people demand the fall of the Field Marshal,” referring to Hussein Tantawi, the head of the Supreme Council of the Armed Forces, which took power when Mubarak stepped down. Protesters who first took to the streets to demand the overthrow of Mubarak, have begun to shift their anger to the ruling military council, accusing it of using Mubarak-era tactics to stifle dissent.